Every online review I read of The Victorian Internet noted it can be finished in one day. I read it in a day through the Kindle app of our iPad, so I will add myself to that list. 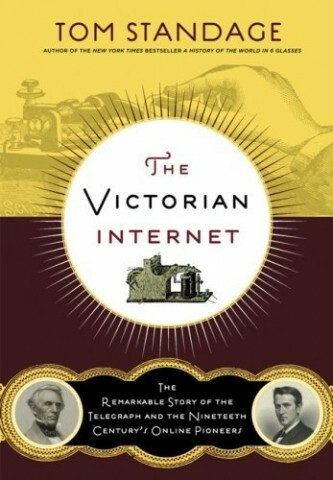 The Victorian Internet is a quick read, so I will make this a quick review. In the book’s conclusion, Tom Standage notes that while Victorians in the modern day would have been shocked at heavier at the airplane, the rocket, and the satellite, as these are all examples of heavier-than air-flight, they would have been bored at the Internet, because they already had their own. Indeed, Standage persuasively argues that the world-spanning network of telegraphy developed in a way almost identical to the world-spanning network of TCP/IP, from the first line between Washington and Baltimore, until the automation of the telegraph lines some decades later. From predictions of the end of newspapers (how can there be a market for ‘news,’ when one person can just tell his friends what he read on the telegraph?) to a new age of peace (as differences were expected to melt away as individuals talked to each other). Also as with modern computer research, the economic advantages of the telegraph were so great that even boondoggles were paid for. In the modern day, technophobic MBAs promise to never again create a ‘wasteful’ Xerox PARC, conveniently forgetting that one PARC invention by itself made it cash-flow positive (the laser jet printer), even telegraph boondoggles were money savers: the intitial, poorly constructed, transatlantic cable saved the British government money, as a timely telegraph allowed London to countermand a mobilization of Canadian troops to India. Telegraph offices provided upward mobility for young tech enthusiasts, such as Andrew Carnegie and Thomas Edison. They allowed individuals to get married in different states (the first ‘e-mail wedding’ spanned only a quarter of the distance of the first ‘telegraph’ wedding). The telegraph even spawned stupid fiction — You Got Mail holds nothing to Wired Love. Individuals had ‘sigs’ (same jargon for the same term) in both telegraphy and e-mail. Ultimately, the telegraph was a victim of its own success. Just as the fiber optics market would collapse because of multiplex devices, the cost of telegraph lines was halved by a duplex, then halved again…. until Alexander Graham Bell’s quest for a ‘harmonic multiplexer’ was discovered to have the side-effect of allowing human voices to be carried over telegraph wires. (Another inventor discovered the devise simultaneously, and perhaps had a better claim to the patent, but assumed that the voice-over-telegraph technology had little commercial application, and so did not pursue his claim at the time). Eventually the Voice-Over-Telegraph technology would be known as the telephone, and the culture of high-tech telegraph knowledge workers would collapse. The Victorian Internet is a great, fun, and quick read. Check it out! I’ve had this book on my wish list for a while now and keep passing over it to buy something else. But I’m glad to see that it’s a good read and will definitely order it. Its fun, informative, and a quick read. I loved the book when I read it. I have been meaning to read a more serisou one about Lincoln use of the telegraph during the Civil War. I’m never quite sure what to make of the “there was always an Internet” or “humans have always had the capacity to think hypertextually” arguments, because we wouldn’t be able to *make* these arguments in the first place if we didn’t have the Internet. But the bad fiction aspect of it is fascinating — many young novelist-hopefuls today think they’re doing something interesting with the “central character finds out about a topic, researches it on the Internet, finds out it has True Personal Meaning for him/her” plot, and then get snickered at. I’ll have to check this one out. I’m especially interested in the argument that the telephone was, in a sense, a technological step backwards. Between the telephone (which allowed completely unskilled comunication) and automation (which replaced the human users), the community around the telegraph collapsed. Perhaps it is similar to the Facebookization of the internet, but on a larger scale. Considering the extent to which electro-mechanical devices were used on the telegraph, that no one invented a telegraph “hypertext” or storage medium is surprising. I’m not sure they would have been bored, per se. Being able to get sound and picture and NOT require the services of skilled technicians at both ends of each transmission would have likely been welcomed.